Director Peter Jackson has basically only worked on 3 film projects in the past 15 years if you count the 6 Lord of the Rings/Hobbit films as one. The others were the big budget remake of "King Kong" and the family drama "The Lovely Bones". I have yet to see any of the Hobbit films and would have rather have seen Jackson branch out a bit more, take some risks and find more original projects. 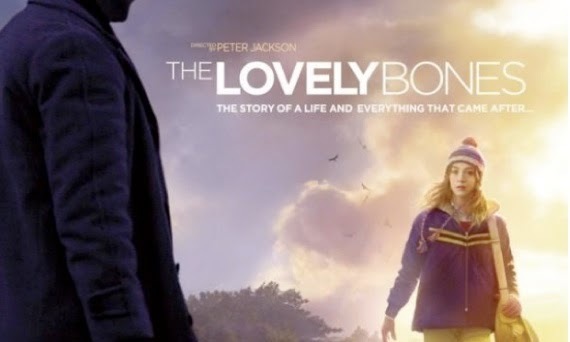 "The Lovely Bones" was adapted from the hugely popular book by Alice Sebold, about a 14-year-old girl named Susie Salmon who is murdered and tells her story from the afterlife and how her family copes with her absence. Pegged as an awards season prestige film by the studio, it severely underperformed in theatres and with most critics. Except for the beautiful and talented Saoirse (pronounced SIR-SHA) Ronan, who plays Susie, and the intensely creepy Mr. Harvey, played by Stanly Tucci, the acting was pretty awful. Rachel Weisz is completely wasted in a bit part as the mother while Mark Wahlberg gives a bland phoned performance as her father. Not to mention the over the top corniness of Susan Sarandon as the crazy grandmother. Since a big part of the film takes place with Susie in a sort of in-between world, there is a lot of gaudy CGI effects that really do nothing for the film or story. *Spoiler Alert* Susie meets with other girls within her own "heaven" that act as sort of spirit guides. These young girls turn out to be the other victims that Mr. Harvey as brutalized and killed through the years. Stanley Tucci really goes all out in his portrayal of Mr. Harvey as he oozes a menacing creepiness with only a look and a hesitation. He is a lonely man who lives by himself and builds and fixes dollhouses. He is reclusive and introverted, you can see the gears working in his mind as he always seems to be up to something. The film plays it safe for the most part and is pretty formulaic in it plotting. It never dives into any deeper questions about death or the afterlife. It just glosses over it with more bad CGI. As with most adaptations, the book turns out to be far superior. It just has more time to tell the full story. The film comes in at over 2 hours but still seems extremely condensed.